Reality television – it’s all a lot of old sh*t, isn’t it? All you ever see are a bunch of half-baked z-list celebrities, all prancing around with nothing more on than a smile on there faces, and a prospect of a new beginning in there hearts. Well, not according to this film it’s not. One, Directed by Peter Weir; and Starring: Jim Carrey, Ed Harris, Laura Linney, Paul Giamatti, Noah Emmerich, and Natascha McElhone. It lasts for a whole 103 minutes, and was made in 1998. 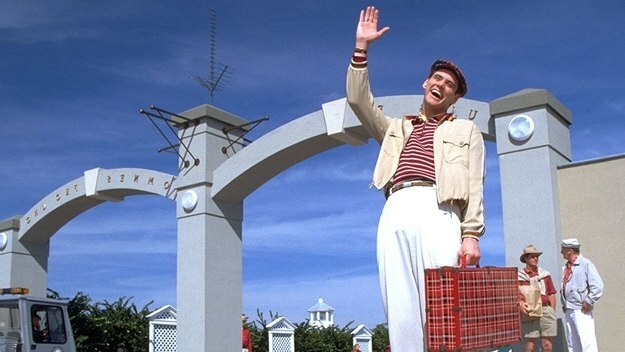 Welcome to the Truman show – a prime-time reality based adventure centered around the one, and only, Truman Burbank (Jim Carrey). The only problem with this however, is that Truman does not know it! You see, since birth, Truman's life has been manufactured by television producer, Christof (Ed Harris), whom hired his wife, Meryl (Laura Linney), employed his best-friend, Marlon (Noah Emmerich), devised his vocation (Insurance sales man), and even instilled into him his fear of the sea too (due to a past incident where is Dad was lost at sea). Surprisingly though, after a series of strange events, Truman starts to notice that something is amiss in his world. Now this all begins when he notices someone resembling his dead father amongst the ‘cast’. So what does Truman do about this? He reminisces about a time when he fell in love with a ‘stray extra’ called Lauren (Natasha McElhone), which inadvertently dredges up a yearning inside him to break free from the confines he is living in. Moreover, this yearning is enhanced even more when other strange occurrences happen around Truman. For example: (1) When he accidentally tunes into the television network frequency on his car stereo. (2) When he notices a corporate building with a fake edifice. And (3) When he realizes that his wife – Meryl – on occasion, acts peculiar around him (because she is promoting a product for the network). In haste, Truman tries his best to break free from his life – by both air, bus, and by car. But alas, at every turn he makes, he is halted in his tracks from behind the scenes – by Christof and his cohort (Paul Giammati) – which result’s in Truman having to be ‘talked down’ time and again by his best friend, Marlon. INTERMISSION: Next, there is a small interlude in which producer, Christof, answers questions posed to him about the show by interviewer, Mike Michaelson (Harry Shearer), before he then experiences a surprisingly harsh telephone encounter with Lauren (Truman’s lost love). Over time, Truman’s life goes back to relative normality again. Granted, on the one hand, his wife, Meryl, may have left him (as she left the show). Whilst, on the other hand, a new love interest has been introduced into his world, and everything appears to be going back to the way it was. Well, under the cover of darkness, Truman escapes from the camera’s watchful eye. Plus in addition to this, no body behind the scenes – or in ‘Truman World’ – knows where he has gone to either. But that is most probably why what next transpires is a right dip in the ratings I can tell you! As searches are made - tempers are frayed - the audiences are dismayed - and a beginning is conveyed. 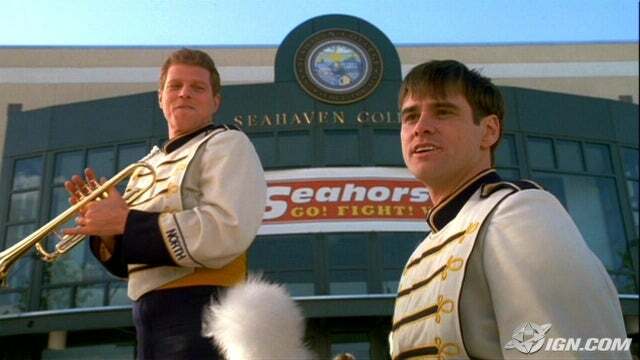 Now before I give you my spiel on 'The Truman Show', let me give you some facts first: (1) Nobody on the set was allowed to refer to Jim Carrey's other films. (2) This film was recorded with the same aspect frame ratio as a television screen. (3) Dennis Hopper was originally cast as Christof, but walked off of the set on the first day. Plus David Cronenberg refused directing duties as well. (4) There is a lot of movie trivia scattered though out the set - such as 'The Three Musketeers' motto transcribed in Latin - and street names referring to old actors [Burt Lancaster, etc...]. (5) Certain scenes were completely improvised by Jim. (6) The majority of this film was on an actual location in Florida. (7) After this film was released, a number of people in America and England experienced what is now known as 'Truman-syndrome' - named after this film. And (8) A number of creative people were assigned to this project at an early stage - like Andrew Niccole, Gary Oldman, and Sam Rami - but pulled out later. OK, so now that the trivia has been splurged, what do I think about this film, huh? Well, first off, I thought to myself that all reality based television programs are just cr*p - so you probably have a good idea about what my preconceptions were. However, after watching this movie, I still think that they are cr*p – and not even one tenth as good as this film. Heck, this flick is bloody marvelous! It has taken the concept of reality TV, perverted it even more than it is, and then spun a rather captivating yarn that is just a wonder to watch. All of the actors involved, Jim, Ed, Laura, and Noah, plus Director, Peter, have done such a great job on this project... well... I am just at a lost for words. They have taken the lowest possible art form – reality TV – and made it into the highest. The camera work is inspired – the mood music is enhancing – the acting is both corny and compelling to watch – and the story in itself is just out of this world. Granted, at times, the overall structure can seem somewhat fragmented – especially the inserts of the audience watching ‘The Truman Show’. Nevertheless, even in this fragmentation, there is a sort of synergy that reinforces the pretext, and enhances the overall experience. Also, I have to mention the underlining message that this film is trying to convey. Because are most media produced programs manipulated with such blind savagery, that 'people' mean nothing and 'product marketing' means everything? OK, it does try to balance this argument by making Ed’s character – the producer – have a heart, as well as a passion for what he believes to be good. Still, in my opinion, this was the most far fetched element of the whole film – not the reality based pretext – just the notion that ‘those on high’ have a passion for something other than the 'big bucks'. Anyway, I thought that this was worth mentioning in the scheme of things, and does not really hinder the film in any way, shape, or form. If anything – it gives you something to think about instead – unlike reality TV. 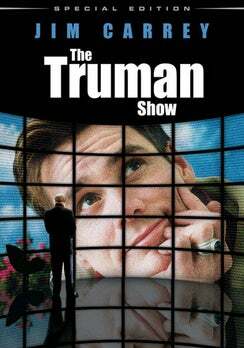 'The Truman Show' - a all time classic.